The CubeSat Kit pricelist is available online for your budgetary considerations. 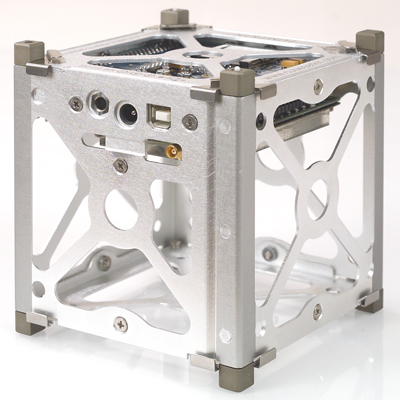 The 10x10x10cm, 1kg ("1U") CubeSat standard has evolved to become the basis for one of the most widely accepted families of nanosatellite designs. Originally proposed by Professor Bob Twiggs at Stanford University, it and its companion P-POD deployer were later developed in conjunction with Professor Jordi Puig-Suari at California Polytechnic University San Luis Obispo. Despite its emphasis on simplicity and low costs, the CubeSat standard address all the critical issues required for a successful mission, from the external mechanical dimensions of the nanosatellite, to the CubeSat-specific P-POD launcher, to test and integration procedures, etc. The CubeSat Kit System Chart illustrates how the design of the CubeSat Kit's structure, electronics and software all emphasize flexibility to accommodate a myriad of potential CubeSat missions. We invite you to become acquainted with the CubeSat Kit, and to learn how it can jumpstart your CubeSat mission. © 2000-2013 Pumpkin, Inc. All rights reserved worldwide.